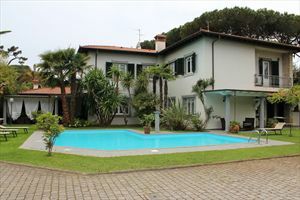 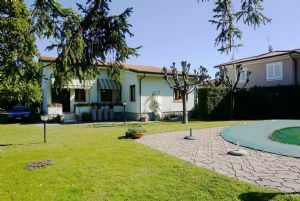 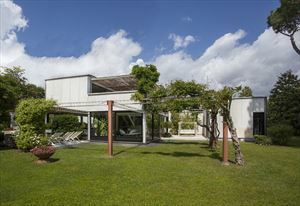 Enchanting single villa for rent in Forte dei Marmi with large garden and an important swimming pool in front of the patio. 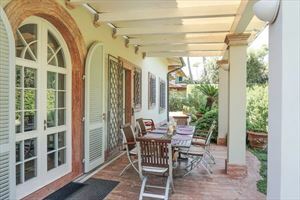 the main is organized in a large saloon,a sitting room,a dining room,kitchen,1 double room, 1 single room (for the working staff) with own bathroom.It has got an external sunny terrace able as lunch room (overview on swimming-pool). 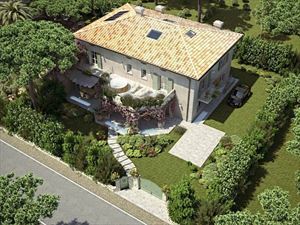 The first floor is composed on 1 queen double room,2 double rooms,1 double room with own bathroom,1 large bathroom . 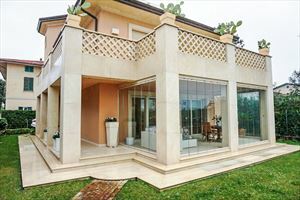 On the top there is a large space with a bed-sofa'.The villa has got different services:air conditionat,2 safe,tv sat,automatic gates,own private parking,alarm system. 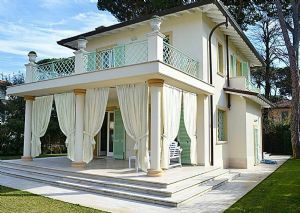 The villa has totaly 6 bedrooms and 5 bathrooms.